We specialise in restrictive covenants, rights of way, ransom strip and other land law issues. The firm's experience gained over many years of practice enables us to take on and find solutions for many Land Law problems. The issues that clients present to us vary in nature but by carefully investigating and analysing each client's requirements we are usually able to identify cost-effective routes that will lead to a resolution of most difficulties that clients experience in this area. 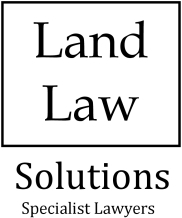 We are quite different from traditional legal practices, as we do not undertake transactional work and we, therefore, put all our efforts into being fully conversant in Land Law issues and procedures which if they arise, can be problematical to many landowners. Derrick Robson and Heather Palmer have worked together as partners in law for more than a decade and enjoy the challenge of assisting clients with problems in this area of law and identifying the best way of achieving the outcome required. Derrick is now a consultant to the firm as he winds down towards retirement. We have a substantial list of clients who have been delighted with the service and results we have achieved. Use of the latest technology allows us to offer services to clients in all parts of the country and the fact that our office may be remote from the location of the problem is not in any way an impediment. All clients are very welcome to meet us for a face-to-face consultation at Bushes House.